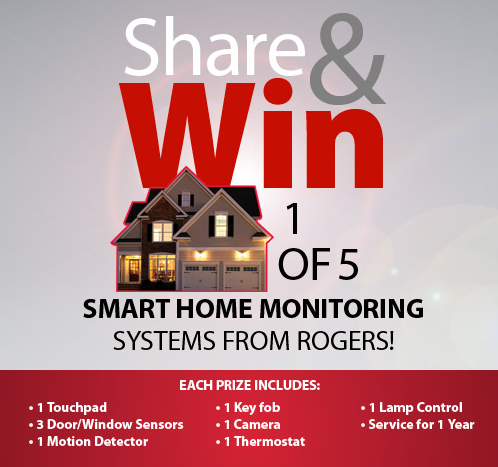 You are here: Home / Connecting / Want to Win 1 of 5 #RogersSmartHome Systems? A Value of $1, 518! Especially when I am leaving the house for the whole day or going away for vacation. Though I always ask someone to house sit on those occasions, Rogers has created one of the most amazing systems that takes the worry out of walking out the door everyday. I don’t know about you but, that’s the kind of thing that happens ALL the time. 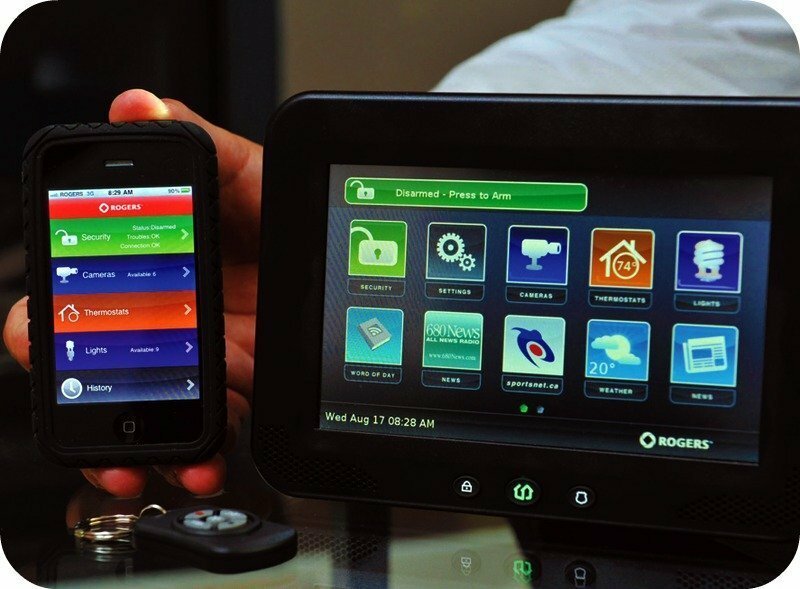 Enter Rogers Smart Home System! It is a state of the art security system that protects your home, even when you aren’t there. Allows you view and control the security system from your smartphone or computer. You can receive INSTANT alerts if there is anything out of the ordinary such as a potential break-in, smoke, fire, carbon monoxide, water leaks or unusual temperatures. It also has an Automation Wizard feature, this allows you to set your system to snap a picture and send it to you when the front door is open. Or when you don’t want to come home to a dark house, you can set up timed lights that will shut them off or turn them on for you. You can even lower or increase the temperature of your home when you are miles away! One of the best parts is that it is a wireless system and if you move you can take it with you! Things like these make my gadget coveting get out of control. I could totally use one of these systems in my own home and when I forget things, I can control them from my third arm iPhone that I am on almost 90% when I need to be. That is definitely a god send because can you imagine the possibilities? Especially with our sporadic weather lately, it’d be nice to be out in 80 degree weather and then come home to a cool house because you set the temperature an hour before you get home. Or the opposite and turn on the heat! It tingles just thinking of what I could do and can you picture the snap shots that you’ll capture with the front-door picture feature? Guess what? 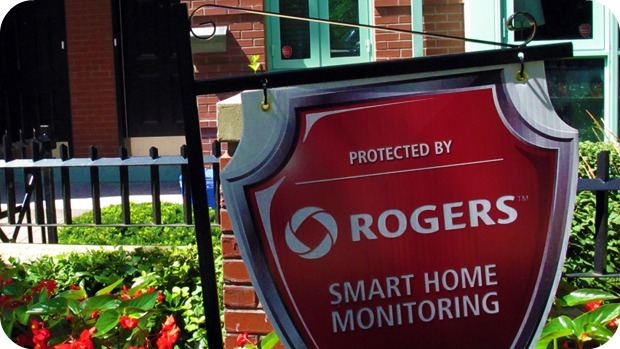 Rogers is giving away FIVE Rogers Smart Home System to Ontario residents! And remember, if you move, you can take it with you! Want even more ways to win? Just simply share this contest via Facebook, Twitter or through email and earn even MORE entries to win! Keep in mind that it is for Ontario citizens only, which is exciting because that gives you an even greater chance to win this amazing prize! The contest is on until 5 PM EST on May 16th, 2012. See here for full rules and regulations. If you rent or own your home, legal aged and live in Ontario, what are you waiting for? 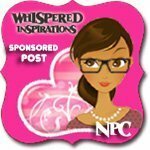 Good luck and I can’t wait to hear if ONE of you lucky readers wins one! Previous Post: « Disney’s CHIMPANZEE Movie Screening Giveaway! Sounds like an awesome system! Sure does, good luck to all Ontarians! Great system, and great contest! What a great giveaway! Alas, I am married to an electrical engineer who works for an alarm system manufacturer and he designs systems. We are currently have an extremely elaborate system put into our house, and we live in a town people don't lock their doors. Most leave the door open and go for a walk. Oh WOW. We definitely need security around here, wish it could be like that. 🙂 That's pretty cool though. I love peace of mind. This system is unbelievable! I can't even imagine being able to control everything from one spot – my iPhone! I'm with you, I have it glued to my hip, so it would be a great fit. Thanks for sharing the contest. My pleasure! Good luck and thanks for entering! Imagine the possibilities! It would be amazing to have, that's for sure. I have a confession to make about this contest. I am going to win it so everyone please stop trying! Nice post Nancy, very cool pictures!